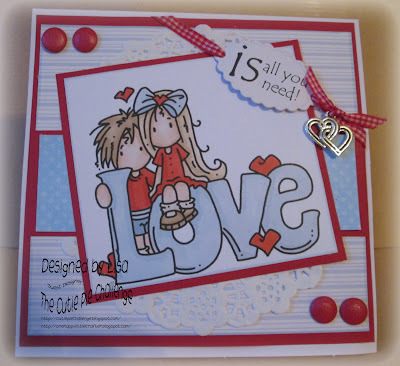 one happy little crafter: The one where the Cutie Pies got loved up! Yep, we want to see your super cute Valentine projects. So thats gotta be worth a look! Onto my own DT card, and this is what I have made and will give to The Hubby. I have used one of the adorable images from Bugaboo, that we were given to play with, coloured with promarkers, the stripey paper is from a stack from The Works and the dotty paper from Bo Bunny. The sentiment is printed and cut out onto a Memory Box label die. Card Candi, ribbon, doily and charm from stash. To join in, or just to have a peep at the other wonderful creations our Cutie DT have made, click the link at the top! very sweet card, love that image. Thanks for playing along with us at Created with love Challenges. This is gorgeous Lisa. I love the cute image and fabulous layout. Really pretty creation, love the gingham ribbon! At a very sweet card Lisa and beautifully coloured. Thanks so much your sharing with us at Allsorts challenge this week. This is gorgeous. Such a sweet image and love ther papers and design. Thanks for playing along with us at Di's Digis! Hello again Lisa. Just popping back for another look at your fabulous card and to say Thank you for taking part in the Ladybug Crafts Challenge this month.